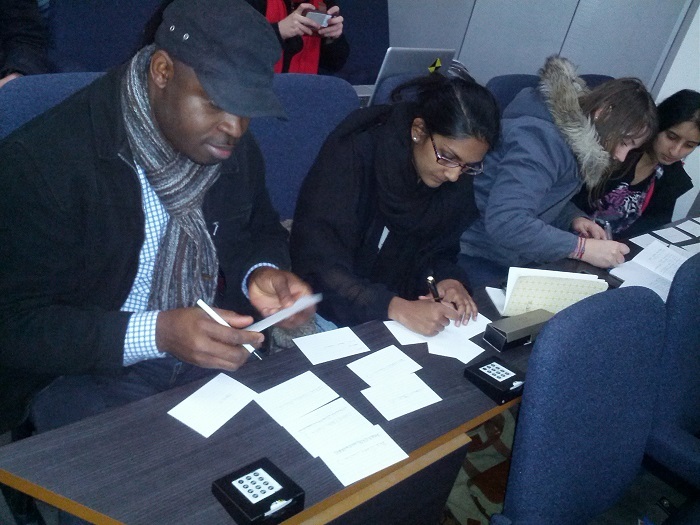 This post describes an “embodied learning” technique for teaching MapReduce, used for our module in Data, Schemas and Applications. 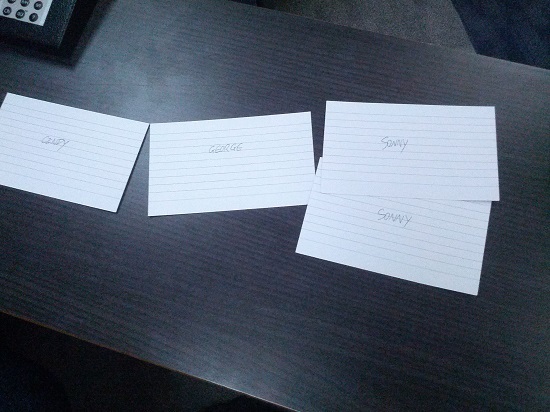 To try and get across the way that MapReduce works, I had students process index cards for the problem of social networks friend recommendations. The algorithm implemented was that described in a useful post by DB Tsai: DB Tsai’s Hadoop M/R to implement “People You Might Know” friendship recommendation. I found some other examples, but most seemed to use two MapReduce steps, whereas this only used one. I had first introduced the pattern and the main steps and emphasised the importance of key(value) pairs as input and intermediate output. Based on the example below, I ask students to put each output line on a new card, with the Key written on the back. These were then placed in piles with key uppermost. If any of them has mutual friend -1, we don’t make the recommendation since they are already friends. //To Fred, we recommend Wilma, with a count of 2 mutual friends. Fred and Thelma are already friends so we don’t recommend her.